Apple could be planning to greatly enhance its "Find My iPhone" security feature in the future, as the company has shown interest in giving users the ability to scramble or delete specific data, or even record audio or visual information in the event that an iPhone is lost. 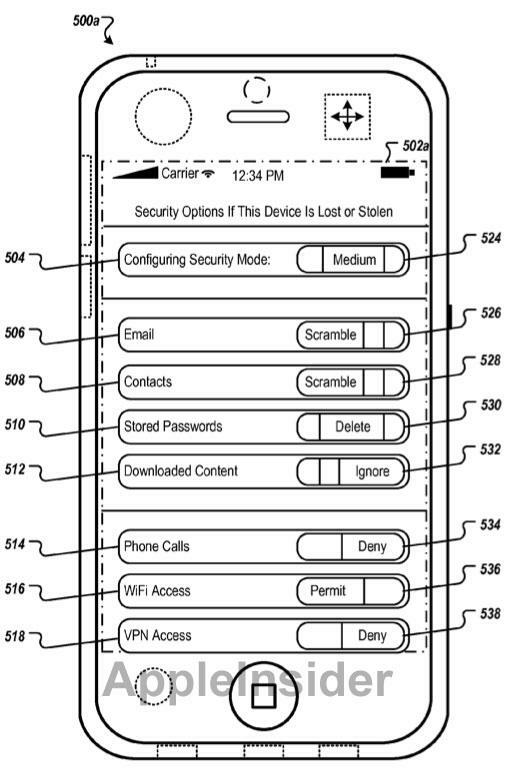 Apple's new potential security options are detailed in a patent application made public this week and discovered by AppleInsider. Entitled "Proactive Security for Mobile Devices," the feature would offer extremely flexible, custom options for security measures on an iPhone. For example, with specific data such as e-mail, contacts and stored passwords, users could selectively choose to either scramble, delete or ignore the information if the handset is reported stolen or missing. Users could even choose to deny a potential thief access to certain features of the iPhone, including the ability to make phone calls or access Wi-Fi. Users could also prevent a security breach to a corporate network by having their iPhone automatically change VPN settings once a security risk has been detected. But a user may also decide to continue to allow some features on a missing device, such as Wi-Fi or GPS, to help track down the handset and identify its location. Keeping that functionality active allows the rightful owner of the device to determine its place on a map. 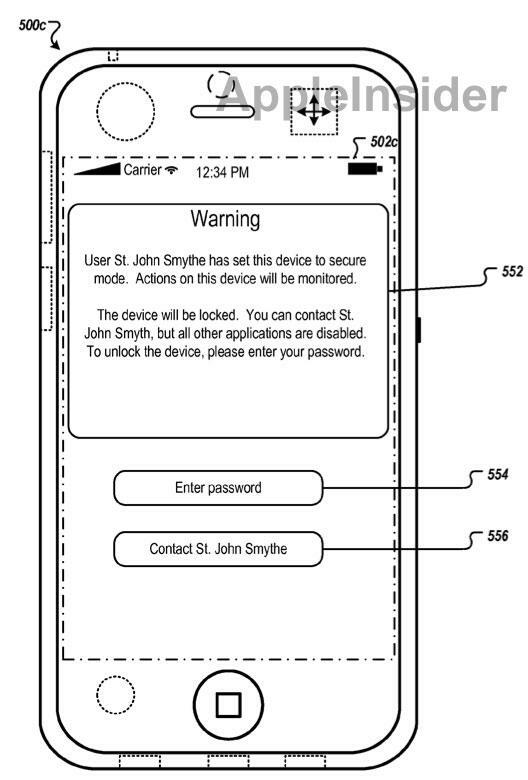 In one example included in the application, the missing iPhone displays an alert that a secure password must be entered within 60 seconds or location data associated with the handset will be transmitted back to the owner. If a correct password is not entered in time, the location data will be sent, and the device can also be locked and restricted only to the functionality chosen by the original owner. For example, the device could become password locked, and the only available activity would be to contact the original owner of the iPhone. Apple's solution could also utilize the sensors inside of an iPhone to record unusual activity, and alert users that their handset is at security risk, potentially preventing it from being lost forever. Such a system could detect suspicious activities like calls or texts to an unknown number. If an iPhone is reported stolen, the device could record images and ambient audio. This data could be provided to investigative authorities to help track down the hardware. These options are more powerful and flexible than the existing Find My iPhone functionality, which late last year Apple made free for all iOS devices. The current service allows users to identify the location of their device, display a message on it, set a passcode lock, or remotely wipe it. 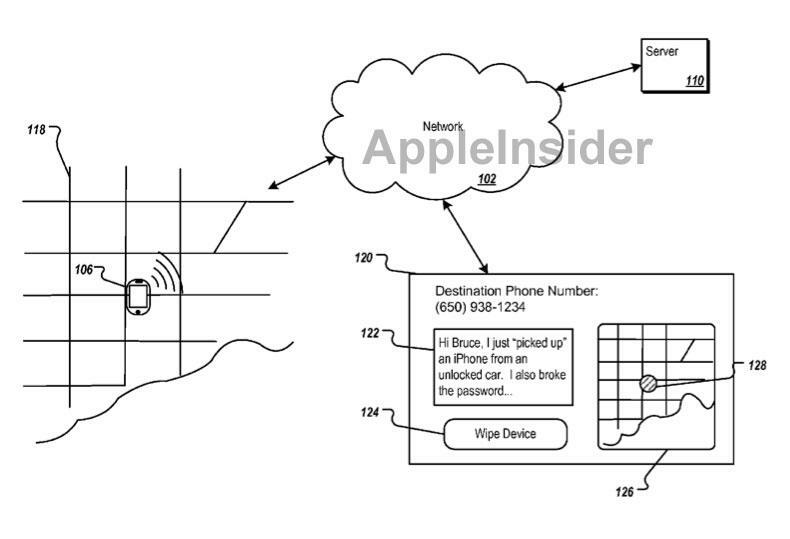 But in its patent application, Apple notes that features like the remote wipe command are an all-or-nothing approach that can be frustrating for users. If a remote wipe is conducted, the user is forced to restore all of the deleted information, which can be inconvenient and time consuming.